I’ve tried a lot of facial cleansers over the past few years. As you age and your skin changes, your facial cleanser has to change along with it. I have noticed that the texture of my skin is not as resilient as it used to be, but one thing that has remained the same is my skin type – I have oily/combination skin that is prone to breakouts when I’m stressed. One cleanser I keep coming back to is the Kate Somerville Purify Clarifying Cleanser. It is my ALL-TIME FAVORITE face wash, and I am on my 4th or 5th tube. This is a cream face wash, and it has salicylic acid to help exfoliate and balance oil production. The key ingredient for me is peppermint oil – this face wash FEELS and SMELLS incredible. I personally love the fresh, cooling smell and sensation of peppermint, and this face wash makes me feel so refreshed and clean. I even look forward to using this in the mornings, because I find that it helps me feel more awake. I use it with my Clarisonic Mia in the evenings when I shower, and it feels like a mini spa experience. Kate Somerville’s more popular cleansers are her Detox Daily Cleanser and Gentle Daily Wash, which both come in jumbo 16oz containers (note to Kate Somerville: can you please make the Purify in a 16oz container too??). I’ve tried Detox Daily Cleanser and only thought it was ok; I couldn’t wait to use it up so I could get another tube of the Purify Clarifying Cleanser (note that it used to be called the Purify Exfoliating Cleanser, but the formula seems to be the same). I HIGHLY recommend this face wash to anyone who loves the cooling sensation of peppermint and has oily/combination skin. At $32, it’s not inexpensive, but as a product I use twice everyday that has therapeutic benefits, it’s worth it to me! Have you tried this before? 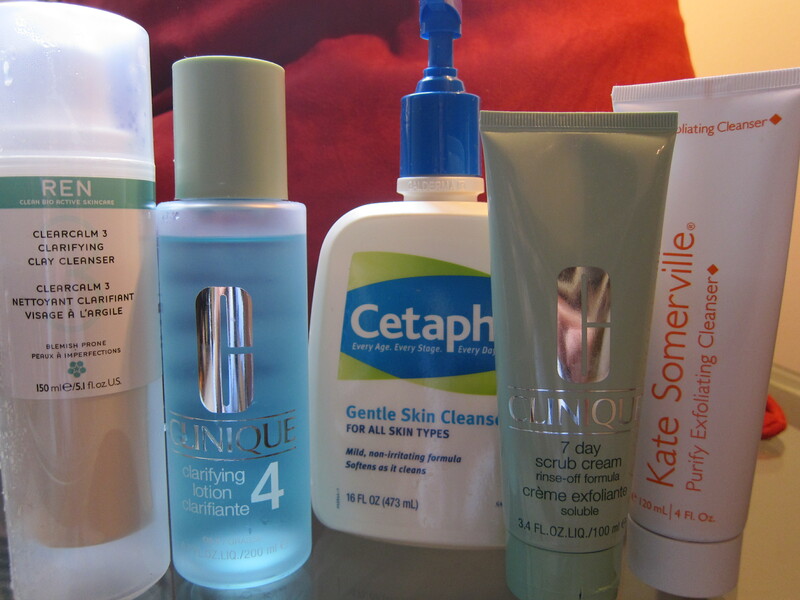 What’s your favorite face wash? *ok I obviously still get the occasional zit but really this is about as good as my face has ever been! I have horrible skin. I have never had smooth beautiful skin ever. I’ve always had acne (mostly white heads on my forehead with the occasional big cyst popping up). The coloring of my skin is not great and I have dark spots from the acne. For awhile, I was on the pill and I had my skin somewhat under control. But about a year ago I went off the pill and all hell broke loose! I started getting horrible little bumps all over my forehead constantly and tons of big pimples. The few days before my period was the worst and I literally wanted to take days off work and take a knife to my face. I tried getting really expensive facials regularly but who can actually afford that. 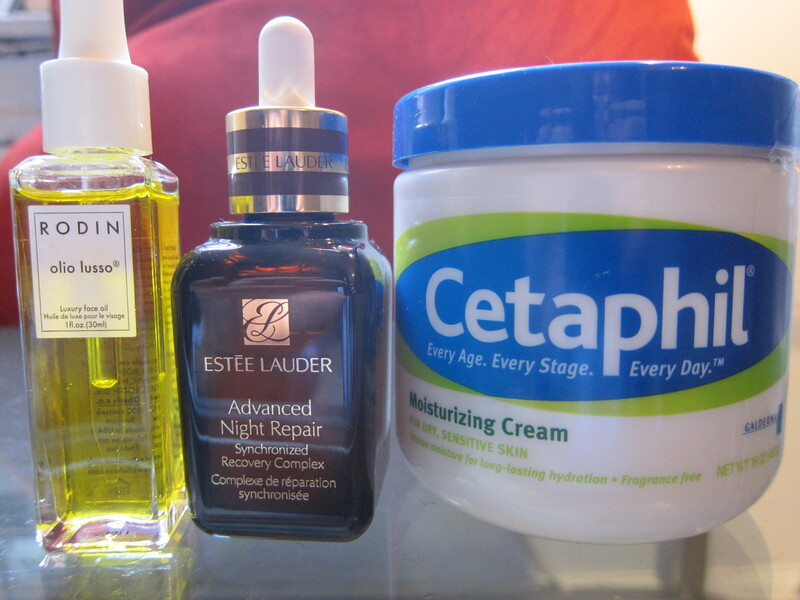 I tried lotions, masks, serums, peels, multiple dermatologists, everything! After several months of epic battling I feel like I finally have a grasp on my skin again. Here is what I use now – I’m not saying this will work for you but this has been helping my skin, so just take these as food for thought! REN ClearCalm 3 Clay Cleanser: I use this in the mornings – I like the way it smells and it’s nice and smooth. Soft clay texture is great and it doesn’t irritate my skin but does cleanse well. Clinique 7-day Scrub: Sometimes you just need a scrub down right – this one is ok – it leaves a slight residue on my skin so I’m not in love with it – if someone has a great fragrance free scrub let me know! Clinque Toner: I’m using 4 right not but it hurts a little bit and during the winter when it is so dry in NYC I am going to switch to a 3. Retin-A: This is prescription from the derm. This stuff really dries out your skin – I think it’s actually supposed to shrink your oil glands. 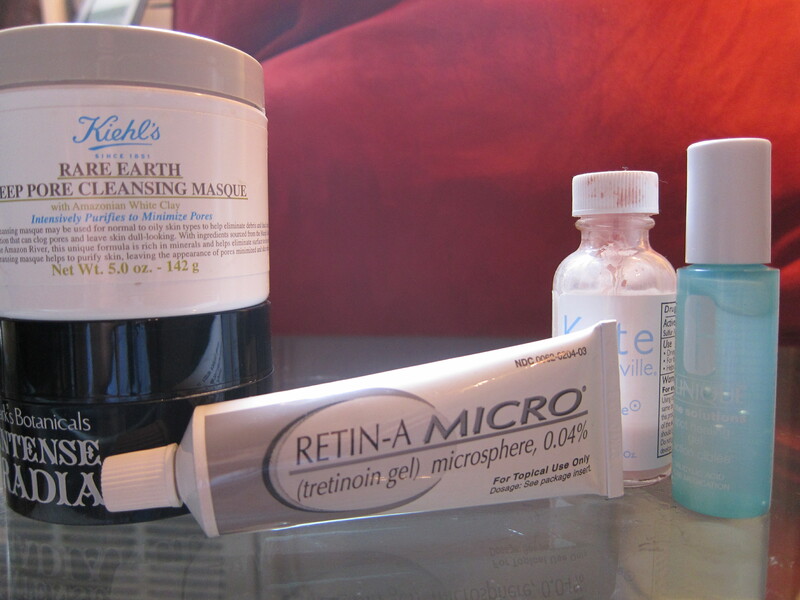 I was getting “Retin-A” face for awhile with red dry patches all over my face so don’t overuse! I use a pea size amount once a week on Sunday night and dot it around my face then use my fingers to spread around. I think eventually I will work up to 3 times a week but I’m taking it real slow. Clinique Acne Solutions Spot Gel: I like this and the Kiehl’s blue spot gel for those problem zits that pop up once in awhile. This is very drying so watch out. Sometimes I will use Kate Sommerville’s pink drying solution at night as well for the bad ones. Clark’s Botanicals Intense Radiance: I really love this mask but it has fragrance (and I’m allergic sigh) so I’m going to have to go back to using my Kiehl’s Rare Earth Deep Pore Cleansing Mask which is also great but more drying. Estee Lauder Advanced Night Repair: I like to use this 3-4 a week at night – when I wake up my skin feels and looks more refreshed. At 28, I’m getting concerned about wrinkles so I like to use this as a preventative serum. This also help with the acne dark spots. Rodin Luxury Skin Oil: This stuff is pure luxury. Putting it on your skin and massaging it in is a treat every time. My skin just soaks it up and it doesn’t cause any pimples. It doesn’t leave my face oily or shiny either. It has a strong fragrant smell but it’s all natural. I love face oils and this one is pure bliss. It leaves my face soft and calm. Cetaphil Moisturizer: I slather this stuff on in the winter when my face is extra dry. It’s basic and affordable and works. I really hope this helps – skincare is one of those things that is very individual and we’d love to know what has worked for you. Share the Glow.